It hasn’t happened yet, but I’m waiting for the day that someone makes fun of me for paying for something in cash. Between NFC-enabled solutions like Google Wallet, Apple Pay, and Softcard, and physical devices like Coin and Swyp, mobile wallets and payment systems are becoming more and more common. And now there’s LoopPay, which Samsung just recently acquired. Samsung’s decision to nab LoopPay is an effort to distinguish itself against its main rival, Apple, by offering a service that’s already widely available. LoopPay has been in the mobile payments game since 2012 and it’s produced quite a few versions of its wire loop and magnetic field powered payment accessories, including a Charge Case, a keyfob, and now, the $50 LoopPay Card. The LoopPay Card offers a glimpse at what it would be like to pay for everything with your Samsung Galaxy S6—assuming, of course, that the LoopPay technology is integrated into Samsung’s next flagship. We put the device to the test against Google Wallet, Android’s main tap-to-pay player, to see which one is easier to use and more widely available. The LoopPay Card doesn’t...really look like a card, does it? 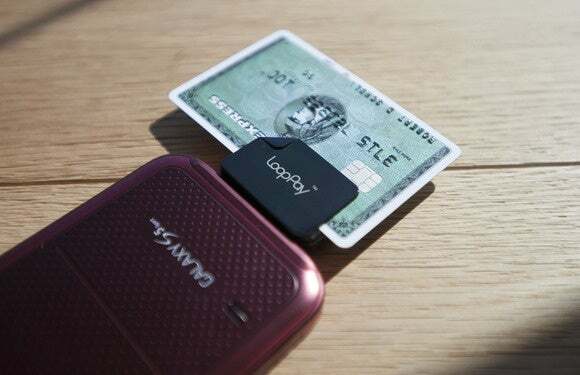 The LoopPay Card is a small black device that weighs 2.7 ounces and measures 2.92 x 2.02 x 0.23 inches. It’s roughly two-thirds the size of a stack of Post-Its and features a small button towards the bottom. There are four small indicator lights along the left-hand side that light up when the device is charging or in use. The card also comes bundled with a micro-USB charging cable, a LoopPay card reader that you can use to add physical cards to LoopPay’s app, and a carrying pouch with a stick-on rear to adhere the Card to your phone. LoopPay Card comes with a dongle that lets you “swipe in” different payment methods. The main difference between LoopPay and mobile wallet services like Google Wallet is more than just this tangible device. Google Wallet exists largely as an app on your phone, unless of course you opt to get a physical companion card. Wallet takes advantage of the existing Near-Field Communication (NFC) technology built into your phone, while the LoopPay Card instead uses a wire loop to create a magnetic field that mimics the stripe on your physical credit card when held near any point-of-sale system that asks for a card swipe. It doesn’t, however, work at terminals where you have to quickly insert and remove your card—like at a gas station or ATM machine, for example. Once your credit cards are stored, you can use them without even taking them out of your wallet. 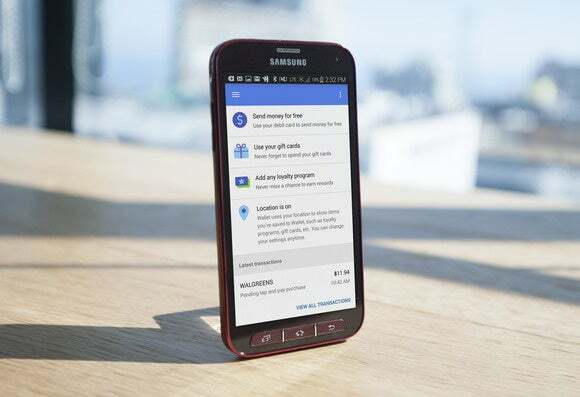 While Google Wallet’s tap and pay functionality works on any Android device running Android 4.4 or higher (save for these five devices), LoopPay works on most Android phones running Android 4.3 or higher, though there have been some compatibility issues reported for eight different handsets running various versions of Android. Both services are also currently limited to the U.S., in part because many of the credit cards used in other countries use chip-and-pin EMV cards, which haven’t yet been entirely incorporated into the existing technology. I spent a few days hitting up several stores in San Francisco to see how both Google Wallet and the LoopPay Card compete in the wild. Finding places where LoopPay worked was like shooting fish in a barrel and I soon noticed that more stores accepted the Card rather than NFC. In fact, I had to purposefully seek out stores that had NFC terminals in order to use Google Wallet. LoopPay offers a little tutorial on how to use the Card out in the wild. It’s not surprising. 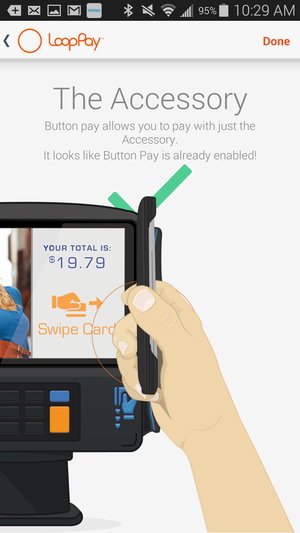 The technology that LoopPay uses essentially creates the same reaction that swiping your credit card does, while Google Wallet requires an NFC-enabled terminal. Google Wallet is only currently accepted by about 208,000 merchants around the U.S.
Google Wallet is nothing more than an app on your phone. Another wrinkle? Some common chain stores, like CVS Pharmacy, have turned off their NFC terminals because they’re working on a competing payment system called CurrentC. In fact, I had two different cashiers claim that their NFC system was down when I tried to pay with Google Wallet. Using the LoopPay with restaurant staff was easier, too, because it only required handing over the Card, rather than my unlocked phone. Obviously, using the Card requires you to remember to leave the house with one more thing in tow, but the upside is that it will also work if your phone dies while you’re out. What if you lose your “wallet”? So what happens if the Card is stolen? LoopPay allows you to disable the Card device if it goes missing. You can then Unbind or Disconnect the Card though the app, though you would still hypothetically be able to use the service using your handset’s NFC capabilities. LoopPay features a few security features, but they’re not as effective as Google Wallet’s. One flaw of LoopPay, however: Button Pay. Because you can hand off your LoopPay Card to a waiter, for example, you can set a delay on how long the button on the card works. If it’s set to Always, then anyone who takes the Card could hypothetically charge your default credit card in the app by using the Card accessory. In the case of Google Wallet, users can remotely disable the app (or physical card) online. Wallet also uses Host Card Emulation (HCE) to encrypt the information it stores on your device for extra protection. LoopPay uses a mobile tokenization scheme that prevents the retailer from getting your real card number. Having a physical card instead of an app has its advantages and disadvantages, and whether you benefit from one over the other depends on your habits. I usually keep my phone zipped up in my pocket, so it was easier for me to pull out the Card and press a button to pay. But if you generally walk around with your phone in your hand, then using it to pay is probably more intuitive. Overall, I used LoopPay much more often than Google Wallet, in part because it was accepted at more places and it was easier to use at the register. It also wasn’t too difficult to set up, and I didn’t mind carrying additional hardware. I do have some concerns about the security element of LoopPay—and the fact that it doesn’t work with all payment terminals—but I imagine that’s something Samsung would tackle in the meantime. One thing’s for sure: Samsung could have spent gobs of money creating their own proprietary payment method, but it made a smarter move by buying a company with a product that already works at 90 percent of places. Google Wallet may not stand a chance. This story, "LoopPay vs. Google Wallet: Which mobile payment method works better?" was originally published by Greenbot.